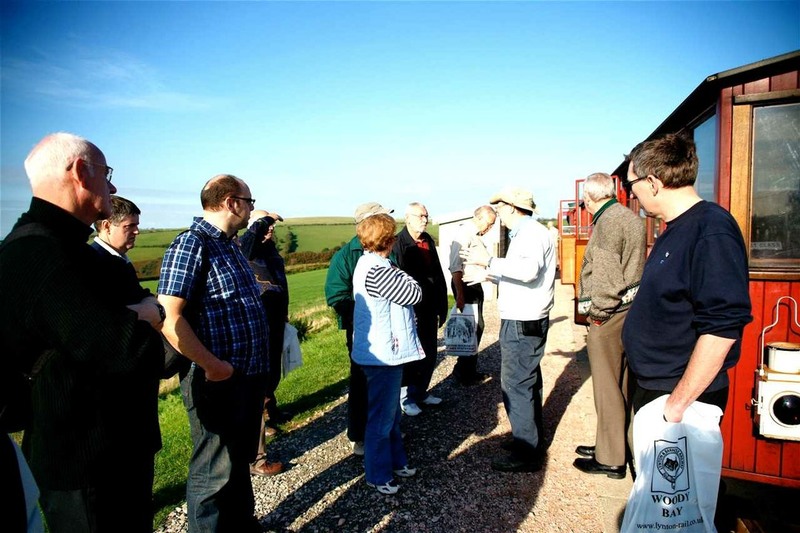 Twenty two members and guests met at Tiverton Parkway Station, on what turned out to be a very warm and sunny day, almost entirely cloudless! 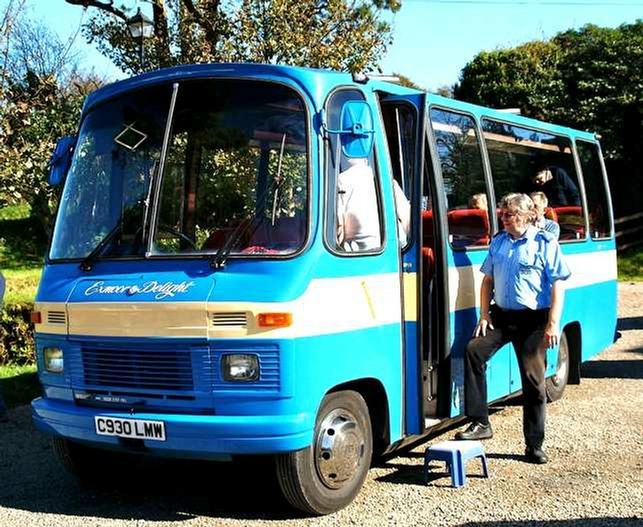 Here Martyn Babb, of The Blue Motors Co., with his 1985 Mercedes 23 seater mini-bus, greeted us. The rare Plaxton Mini Supreme body has good panoramic windows, but not necessarily a lot of legroom to stretch out! Our first destination was Barnstaple, just under an hour away via the A361. The road has been improved in places, using part of the former GWR line. The 19 mile Lynton and Barnstaple Railway was finally opened on 11th May 1898, with a gauge of 600mm, 1ft 11 in. The engineering of the line, and the construction cost was far above what Parliament was told in the Bill! 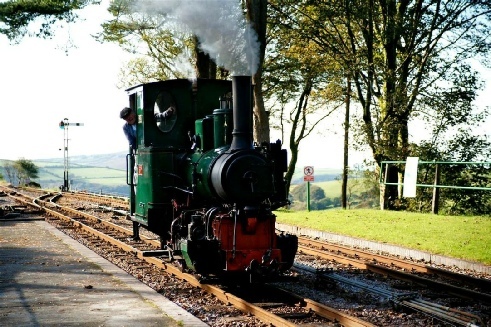 It struggled to make money, and although the Southern Railway made improvements after they took over in 1923, it closed as long ago as the 29th September 1935. Within a year, the line had been lifted, most of the stock and fixtures sold off. 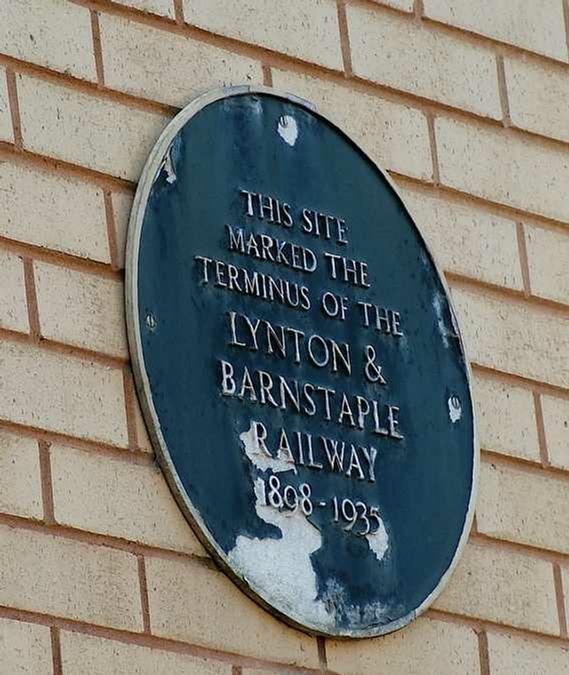 We started our coverage of the line at Barnstaple Town Station, at mid-day. It is still intact, and is now used as a school. The adjoining signal box was used by the L&B Society at one time as an exhibition gallery, but has now incorporated into the school. The former route could be seen as we went through the town, but putting the track back now is surely impossible, with buildings now on most of the track bed, and level crossings required across busy main roads. The main workshops/offices were at Pilton Yard; the wooden engine/carriage sheds were burnt down in 1992. 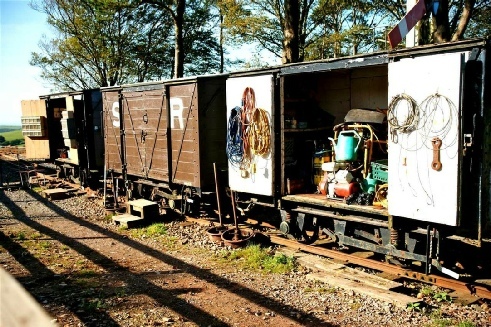 At the first station, Snapper, two coaches were surprisingly left to rot following closure, rather than being sold off at the Auction. 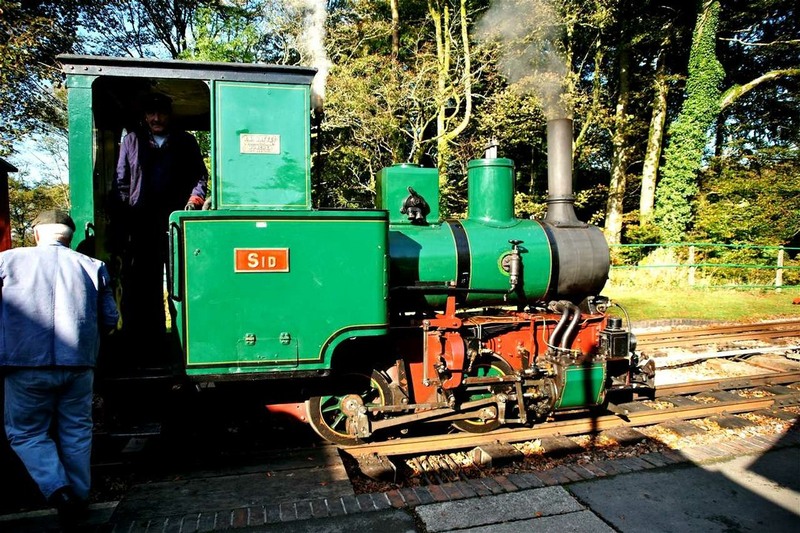 One was later acquired by the Ffestiniog Railway, rebuilt, and is still in service; vandals eventually burnt the other out. A few years ago some society members armed with metal detectors had a hunt around the vegetation, and were able to retrieve hinges, handles and fittings! Maybe one day the coach could be rebuilt? As we headed out along the country lanes, Martyn gave us a good running commentary, pointing out the former line and various features. 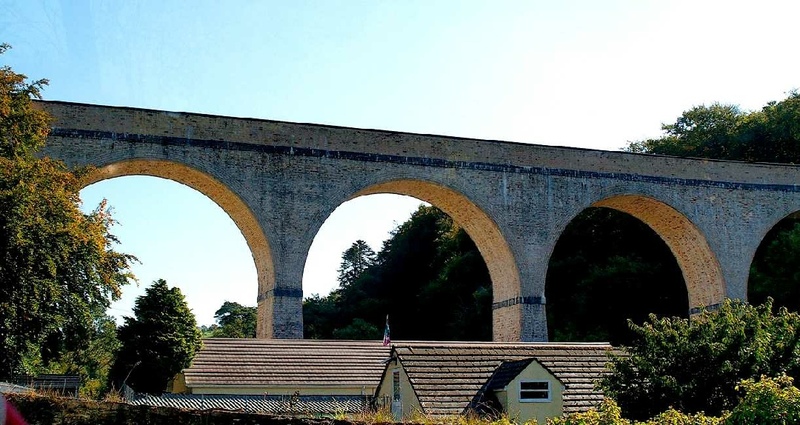 At Chelfham, the huge 8 arch curved viaduct (70 ft high, 132 yards long) dominates the area, with its white brickwork shining in the sun. About 10 years the owners, the British Rail Property Board, carried out a major repair. The L&B Society gave around 20,000 to get the parapets replaced (easier when the scaffolding is already there!). In return the viaduct will be sold to the Society for 1 when the time comes to relay the track. 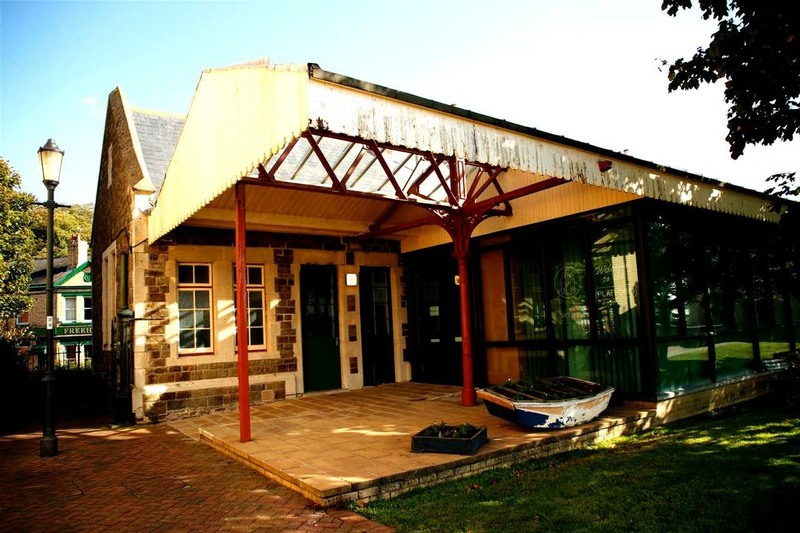 The Society has set up a separate company to look after the former track bed and buildings. As land comes up for sale, or the owners grant it to them, it is bought. 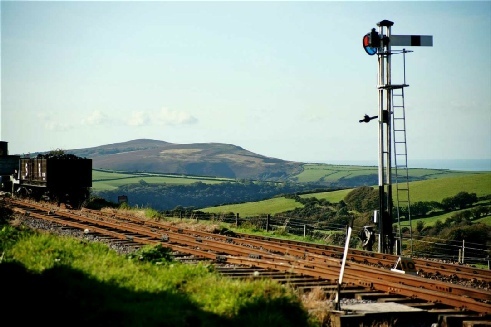 By renting it back out, such as for farmland, or holiday accommodation, then an income can be generated until the time comes to restore the tracks. The buildings and land around Chelfham Station being a good example of this. We then made our way through Bratton Fleming (passing a small industrial estate, where one unit was used for several years for restoring rolling stock), to Blackmoor Gate station for lunch. The old station buildings have been extended, and converted into a pub and restaurant. As we had made our choice earlier in the day, and the order phoned through, we didnt have long to wait. Especially helpful on a busy schedule like we had! When reopened, the tracks will have to take a slightly different line, in front of the old station, and away from the awkward road junctions. Suitably fed and watered, we retraced our steps to Bratton Fleming. The station is about half a mile lower than the village, down a steep hill, not good for loaded returning shoppers! A railway bus service was started in 1928, with half the area for seats, the other half for goods, like milk churns. But it unfortunately soon had to be stopped, the GWR buying the vehicles. Leaving Bratton Flemimg, we continued on narrow winding country lanes until we joined the track bed. In the severe winter of 1948, several farms were cut off. So the Milk Marketing Board helped pay for the old track bed to be converted into a road, which involved lowering an embankment to provide a wider base. This level road was more suitable for road tankers (and more guaranteed) than the narrow, twisty, and hilly country lanes. 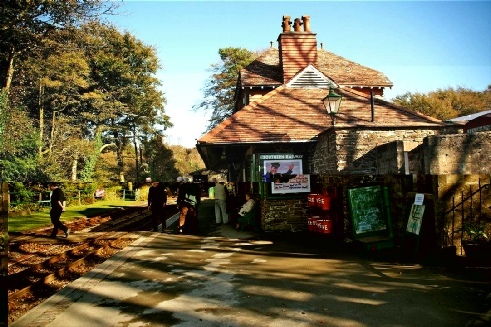 Once back on the main road, we headed for Woody Bay Station. After a look around (some had a cup of tea! ), we boarded the last departure of the day. 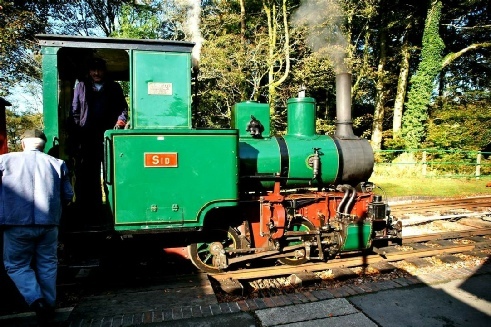 0-4-0 steam locomotive Sid and three coaches formed the 15.45. Most were able to get in the rear carriage, where one of the Society members gave us a short talk. Public train services started running again in May 2003. At present the line only goes for about one mile, to a temporary station at Killington Lane, where there is a platform, run round line, and some sidings. Alongside could be seen part of the cutting, and where the road bridge will have to be replaced. The next extension will be from here south, on the original line, to Blackmoor Gate, about 3 miles away. 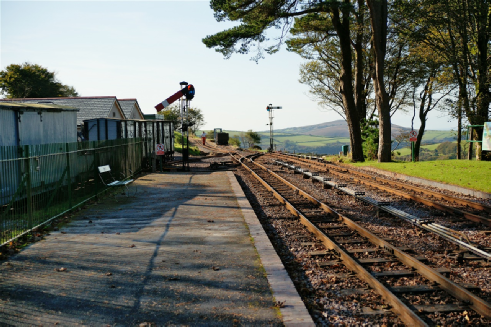 Then it was back on the train for the return to Woody Bay Station, a fine two storey building. 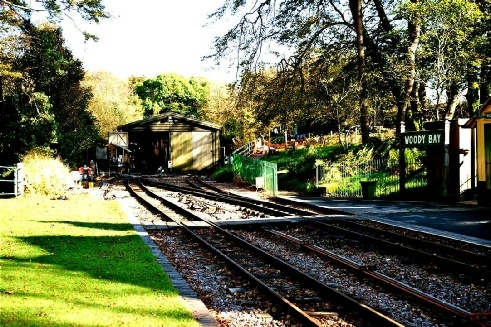 A carriage/engine shed, and other buildings have been built here. Another quick look around, and then it was back aboard the Mercedes, we continued towards Lynton. Martyn continued with his excellent commentary as we went, the former line keeping close to the roadways. At Lynton we stopped outside the former station and goods shed. 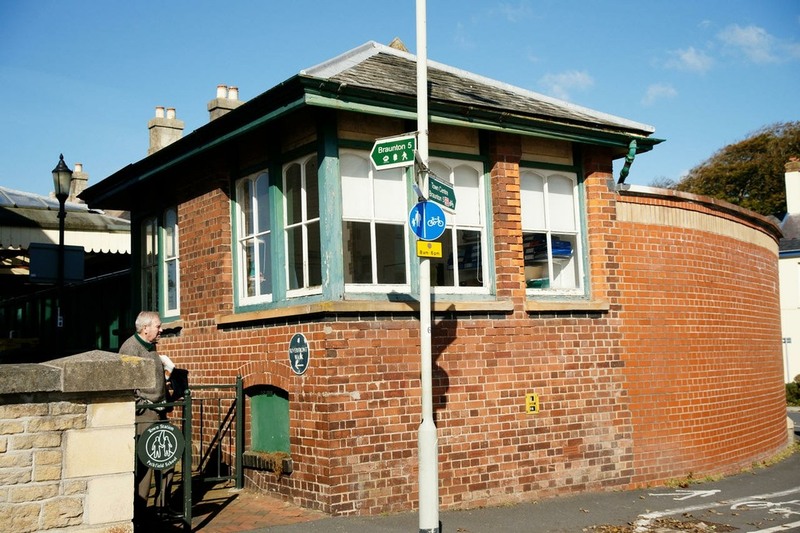 Both buildings are now in residential use, but keep the same appearance as when the railway was open. This station is poorly situated, on the edge of the town, and higher up. We drove round the corner to the area of the proposed new station, nearer the town centre. Continuing, we came to the top station of the Cliff Railway. Most got out, a couple stayed on the bus for the steep road trip down to Lynmouth. The Cliff Railway opened in 1890, and is a very green operation. A tank on the top car is filled with water, from reservoirs filled by the West Lyn River a mile away. Water is drained from a tank on the bottom car, which becomes lighter, and so gets hauled up the railway by the heavier, descending top car! 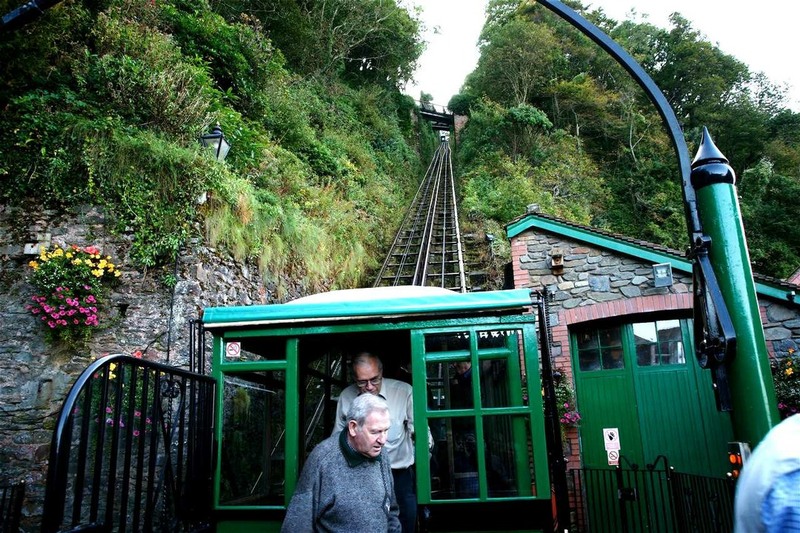 The railway is 862 feet long, the top station 500 feet above the lower. The brakes incorporate a forerunner of the Deadmans Handle used to this day. Wonderful views were had on this sunny afternoon, looking along the coastline, with the tallest cliffs in Europe in the distance. Then it was back on the bus again, time now getting on, about 17.00! Passing through Lynmouth, water levels and sights were pointed out relating to the tragic floods of 1952, when 34 people died, due to the huge volume of rainwater that came rushing through the town, two rivers and their tributaries combining to meet in Lynmouth. We took the winding A39 out of town, fortunately not meeting any lorries or coaches on the way. A fine wooded gorge, with the East Lyn River running through it. Then it was out across Exmoor, starting with the B3223 to Simonsbath. The vast open area, at times an unfenced road, looked spectacular on this sunny afternoon, but on a cold bleak day/night, a different situation! We continued, speed picking up, where possible, with the aim of getting the 18.16 from Tiverton Parkway to Paddington. But there are not many dual carriageways in this part of the world! We slowed in/near Bampton, looking at where the old GWR station and line (to Barnstaple) had run. Time getting on, our only hope was the train running late, but as we neared Tiverton we annoyingly saw the First Great Western HST slowing for the station bother, missed it! For much more information, the Lynton and Barnstaple Railways website is www.lynton-rail.co.uk. Several books and magazine articles have been written over the years. A good book I obtained on the day was a recently enlarged edition by the Surrey Support Group. This is a line I’ve always wanted to see, and we certainly explored it well today! 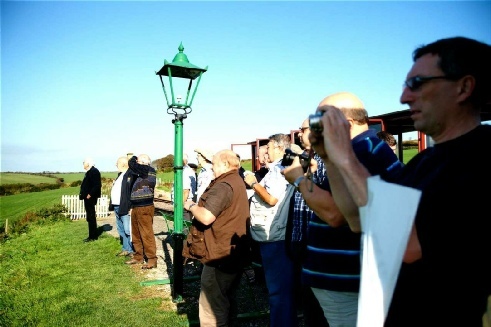 Thanks for a wonderful day out go to Martyn Babb (Blue Motors) for his enlightening commentary during the day, and his Mercedes/Plaxton mini bus, and Brian Ashfield (L&CI) for organising it. And the weather as well, hardy a cloud was seen all day!